Teriyaki and yellow bean sauce add depth to this healthy - and super easy - stir fry. For the yaki soba dressing, bring the teriyaki sauce, yellow bean sauce, lemongrass and ginger to the boil in a small pan, stirring well. Reduce the heat until the mixture is just simmering, then continue to simmer for 8-10 minutes, or until the mixture has thickened. Set aside until ready to serve. Meanwhile, for the noodles, cook the noodles in a large pot of boiling water for 2-3 minutes, or until just tender. Drain well, then refresh under cold running water until the noodles are completely cold. In a bowl, mix together the eggs, peppers, onion, spring onions, mushrooms, garlic and bean sprouts until the vegetables are coated in the eggs. Stir in the teriyaki sauce until well combined. Heat the oil in a wok over a medium heat. Add the egg and vegetable mixture and the cooked, cold noodles, and stir-fry for 3-4 minutes, or until the noodles have warmed through and the eggs and vegetables are cooked through. To serve, divide the vegetables and noodles equally between two serving bowls. 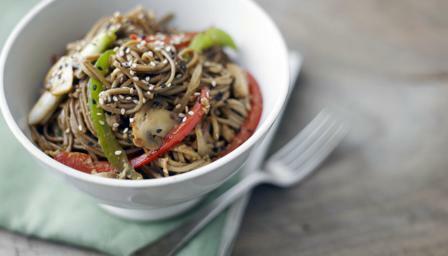 Drizzle over the yaki soba dressing. Sprinkle over the sesame seeds, if using.